Jolene Rickard (Tuscarora) presented us with images that invited us to think about Indian artifacts—when are they appropriated and when they are merely reclaimed? Her talk, sponsored by the Newberry Library’s D’Arcy McNickle Center in Chicago, focused on the edges of ethics and sentiment, and of art and appropriation. Rickard, director of the American Indian Program at Cornell, showed a display she curated at the National Museum of the American Indian. Some 3,000 bibles have been translated into indigenous languages. She encouraged us to consider what that means for native people. She then showed a photo of a border crossing between the state of New York and the Mohawk nation. A the juncture of the two nations, artist Alan Michelson (Mohawk) has installed Third Bank of the River, a 40-foot-long glass rendering of the St. Lawrence River—a river that divides Canada and the US. 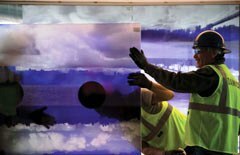 The glass artwork mirrors the image of a wampum belt, tilted on its side, Rickard explained. But what gives you pause is the location of the art: right at the nexus of a border that represents heart-breaking moments in colonial history. She asked us to consider what the placement of such an important work of art means. “The border crossed us. We didn’t cross the border,” Rickard said. This entry was posted in authenticity, ethics, Indian, repatriation and tagged Indigenous Science, rhetoric, stereotypes. Bookmark the permalink.